Kingston anchors the western end of the Washington State Ferry Edmonds-Kingston route. It's a beautiful and scenic 30-minute ferry ride, perfect for a walk-on ferry adventure in either direction, especially during the summer. 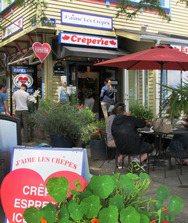 Kingston's charming main street is lined with shops, pubs with local brews and assorted restaurants. The Kingston Chamber of Commerce and Visitors Center, located directly in front of the Kingston-Edmonds ferry terminal, offers travelers to the Kitsap Peninsula and beyond a wealth of information. 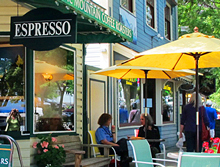 While there, take a leisurely tour of the town and enjoy the natural beauty of Kingston and the Kitsap Peninsula. Read our blog for more info. 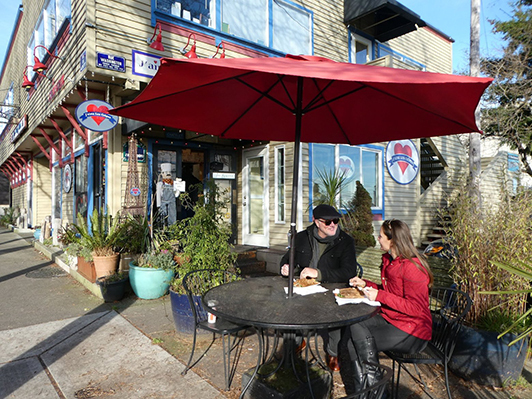 "With farm-to-table meals, mini doughnuts, inviting beachside trails and much more, just a ferry ride away from downtown Seattle, Kingston is the perfect place for a winter day trip." Click here to read entire article. 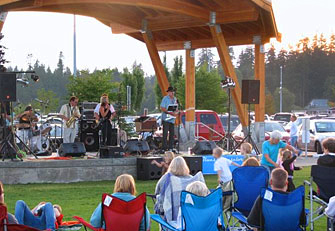 Kingston hosts a number of family-friendly events all year and many are held at the Mike Wallace Waterfront Park, next to the Edmonds-Kingston ferry terminal, including Kites Over Kingston, Paws Fest, Fourth of July, North Kitsap Arts and Crafts Festival and a Country Christmas, all free and open to the public. The Kingston Farmers Market is open nearly every Saturday 9:30 a.m. to 2:30 p.m. Saturdays through mid-October. On Saturday nights in July and August, the Port of Kingston co-sponsors Concerts on the Cove. Musicians from around the state put on free, family-oriented performances from 6-9 p.m. Kingston Rotary Club sponsors a no-host beer and wine garden, and a variety of food vendors each week are present for your enjoyment. Free two-hour parking is available for short-term visitors, and a pay lot serves those staying for the day. Visit the Kingston Chamber for more events..
One of the regions most popular marinas. Overnight moorage and amenities available. Click here for details. The Port of Kingston Marina also is a favorite stop on the Kitsap Peninsula National Water Trails, offering a wide range of boating and kayaking amenities and services. With the launch of the new Kingston fast ferry, Kitsap Transit now provides convenient passenger ferry service from Kingston to Seattle and back. The weekday schedule serves commuters, residents, and visitors with early morning and late afternoon runs. Click here for the Kingston info & schedule. Catch the bus to work, shopping, lunch or to visit friends. Travel inside the service area or meet a bus to connect to Suquamish, Indianola, Bainbridge Island and beyond. Kingston Ride will also provide service to the Kingston-Edmonds ferry for those passengers needing transportation across the Sound. 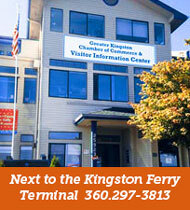 Monday - Friday: Service starts at the Kingston Ferry at 8:00AM with last pick-up at 4:00PM. Click here for more information. AirbnB - Search "Kingston WA"